**You have likely to been redirected here because we have contacted you to update your payment on file with us. It is always best, whenever you need to access your ShuttleCloud admin page, to start within your G Suite Admin Console. This ensures that you will have already logged in as a Super Administrator of your G Suite Domain. As with all Marketplace Apps, administrative access to ShuttleCloud is tied to Super Administrator status on your primary G Suite Domain. Clicking on “Billing” (highlighted above) will bring you to the following page. You’ll notice that Google is directing you to contact ShuttleCloud. “Contact reseller to modify order” is actually a link that you can click to bring you to ShuttleCloud’s administration tools. From here on out you are on ShuttleCloud’s admin page. There are a few options but the one we’re interested in right now is “Billing info” as highlighted above. Now you will be on our billing panel. In order to update your payment method, simply click on the "Change payment method" link highlighted above. This will reveal two options - one to add a credit or debit card and the other to add a PayPal account. Start by clicking “Add a credit or debit card” indicated above. A popup will prompt you to enter a credit or debit card. Please also enter a valid email address so we can best support you. A green marquee will appear at the top of the screen as confirmation that you’ve activated a new card with Carbo. You are now all set and we will be verifying and charging your card within 24 hours. In the meantime, you can also check your invoices by clicking the “Invoices” heading on this page. The process for adding a PayPal account is very similar to adding a credit or debit card. First select “Add a PayPal account” as indicated above. At this point you can either enter the credentials for your PayPal account, or if you don’t have one choose to create a new account. Either way, once you’ve logged into PayPal on this page, you will be asked for confirmation. 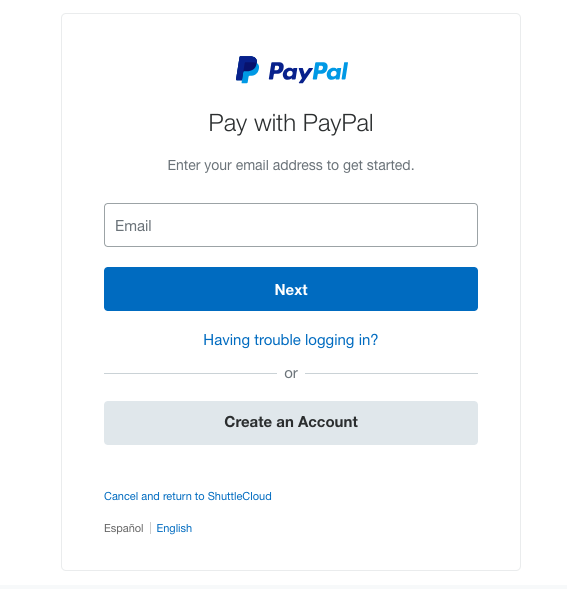 Please click “Agree & Continue” to confirm that you want to pay ShuttleCloud with your PayPal account. Like with adding a credit or debit card, a green marquee will appear at the top of the screen as confirmation. 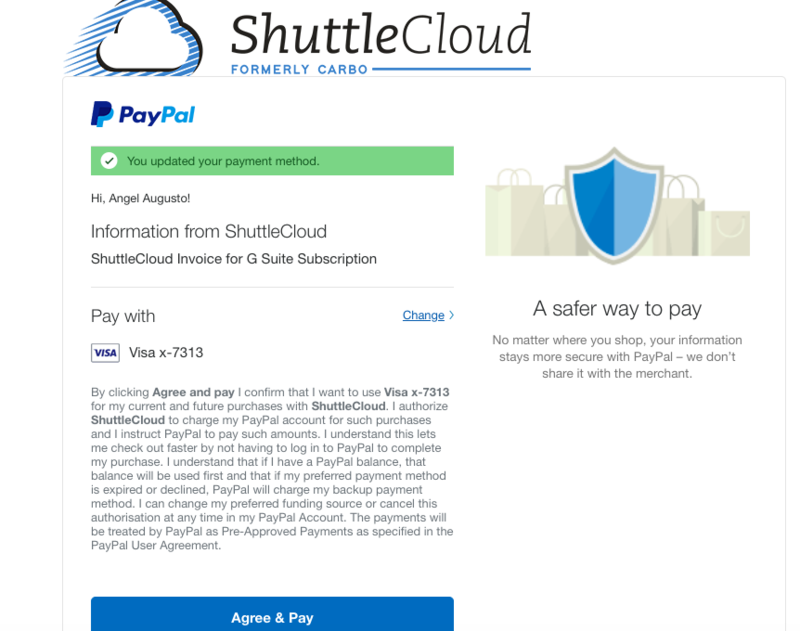 You have now activated PayPal as the payment method for ShuttleCloud and your Google Apps services.